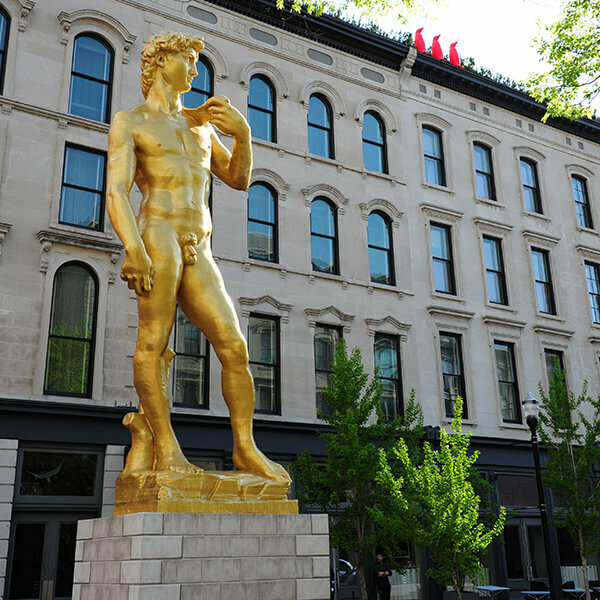 Expect the unexpected at the 21c Museum Hotel in Louisville, KY. The combination contemporary art museum (some 9,000 square feet of exhibition space) and lodging facility (90 rooms) is a creative collection of surprises—and functional designer comfort. Opened in 2006, the 21c (which stands for 21st century) is located in several of downtown Louisville’s 19th century bourbon and tobacco warehouses. Two blocks from the Ohio River, the hotel is only a block from the Louisville Slugger Museum and close to he Muhammed Ali Center. The historic building feels cutting edge and hip—minimalist, well-designed and cool—but warm southern hospitality is still there too. As the bellman unloaded my suitcases from the car, he was friendly and chatty, asking why I was in town, recommending places to see and best places for a drink or morning coffee. At the check-in desk, I felt like I was getting tickets to enter a museum (well, I guess I was in a way– although the museum part of the 21c is free—open 24/7). 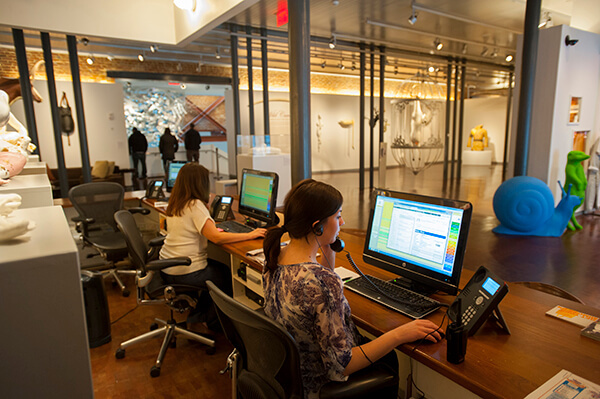 Desk clerks sit in front of computers with a row of well-lighted unusual sculptures displayed behind them–and museum exhibitions in front of them. The lobby itself is all exhibition space, and even waiting for the elevator, I found modern artwork. The chandelier in that space was made from dozens of sparkling silver manicure scissors and an interactive wall screen had several young guests admiring themselves on video while they waited. In the hotel’s award-winning restaurant, Proof on Main, artwork lines the walls too—at least in the center dining area (make sure you ask to be seated in that area) versus the tables and section near the noisy open kitchen, where you can hear the workers hollering out orders. The food is sensational—and there’s a reason the place keeps receiving accolades. 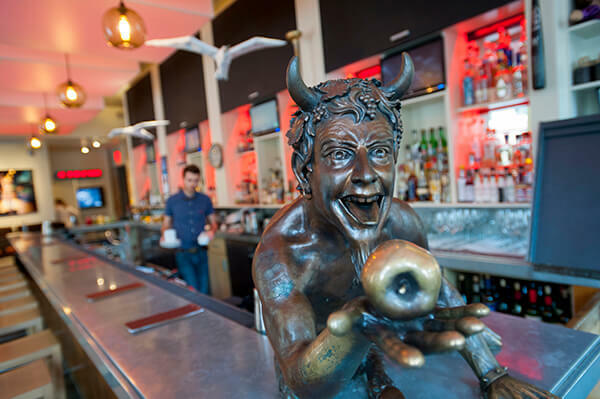 The bar is another lively spot—with some 50 bourbons to choose from–and yes, more creative sculptures and artwork showcased throughout there as well. Although I did not have time to partake of the pleasure, the spa at the 21c offers various massages along with a fitness, sauna and steam room facility. Rooms range from deluxe doubles, and various suites to a rooftop apartment with a garden terrace. My spacious room was a “Luxury King Cityview” with a desk/table workspace that included an ergonomic chair along with complimentary wi-fi. Exposed brick walls, high ceilings, brushed steel, and neutral carpets made the room seem abit austere and plain to me, but it fit with the modern art design and hotel concept. Most importantly, the bed was super comfortable and the bedding luxurious and soft. I loved that instead of the usual glassware, the room had pewter mint julep cups along with a gourmet coffeemaker. The room also had a 42-inch flat screen t.v and an ipod docking station. The bathroom was not huge, nor especially remarkable, but the Malin + Goetz toiletries were a nice perk and the little yellow rubber ducky for the tub was another unexpected and fun surprise. Because of its overwhelming success in the Bluegrass state, the 21c Museum Hotel’s team has opened similar modern art plus boutique hotel experiences in Cincinnati, Ohio (yellow penguins) and Bentonville, Arkansas (green penguins). Another in Durham, N.C. is currently under construction. For more information, check the hotel’s website. You can also check rates at Hotels.com, Travelocity or Priceline. Review by Donna Tabbert Long who was hosted by the hotel while researching a story about Louisville, KY. Photos courtesy of professional photographer Michael Ventura.